The challenge is finding hearty, filling — and meatless — meals. When I started, we were still in the throes of winter, and the last thing I wanted to eat was a chilly salad or one more bowl of soup. Those are the likeliest vessels for going all veggie, I’d found. So I started to research — in magazines, online, on Pinterest. And I found one decent solution: mushroom bolognese. The texture of mushrooms, especially a cremini or portabello, is enough to trick my brain into not missing the meat. And I’ll eat shoe leather if it’s covered in a hearty tomato sauce over pasta. This turned out just right — it’s tummy filling but not in a bad way. The trickiest part about my new eating plan is how not to fill the space left by meat with carbs. I’m not doing so well there — it’s so easy to put veggies on pasta, atop pizza, between bread. Once I started making my own marinara sauce, there was no going back. I could (okay, have) eaten this with a spoon right out of the pot. Amazing. * I also get weirded out by canned food and all that BPA in the lining. It’s supposedly worst for canned tomatoes, since the acidity in the tomatoes leaches out more of the chemical, so I buy the Pomi strained tomatoes in the paper box. They’re a little smaller, about 26 oz, but I’d rather. Chop the onion into large chunks, and add to the bowl of a food processor. If you don’t have a food processor, you could just dice them as small as you can. You could also chop all the vegetables into small chunks and use an immersion blender (that stick blender thing) to puree everything after it’s cooked. Anyway, run the onion through the food processor until it’s chopped very finely. You don’t need to puree it into nothing, though. Add the onions to the olive oil and let them cook until soft, about 3 minutes. 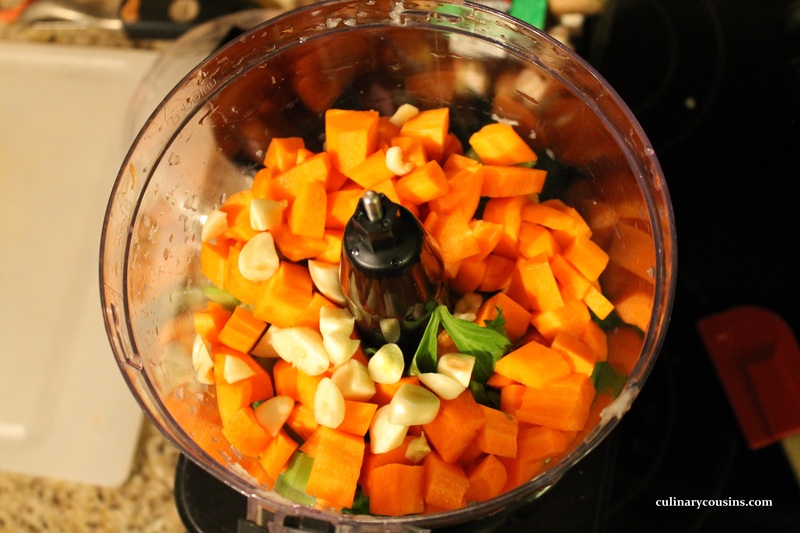 Meanwhile, chop the carrots and celery into chunks and peel the garlic. Add all of that to the food processor and process it the same as the onions. Then add to the pot and stir. Add salt and pepper to taste, about a teaspoon of salt and a half teaspoon of freshly ground black pepper. Saute all of the vegetables until they’re soft, about 10 minutes. Add the tomato paste and tomatoes. Add any optional ingredients you’d like to use. Simmer uncovered on medium-low heat (though you might want to put a shield on it, since it splatters) for one hour until the sauce thickens. Stir occasionally so it doesn’t burn. After an hour, taste it and adjust the seasonings. It may need a teaspoon of sugar to balance the acidity in the tomatoes, or more salt/pepper. You could also add a tablespoon or so of fresh, chopped basil at this point. In a medium pot, heat 1 tablespoon of olive oil over medium heat. Take the caps off of the button mushrooms and cremini mushrooms and discard the stems. I also wash them, since that mushroom dirt grosses me out, but I hear that’s really a no-no. Hey, live on the edge. Run the white button mushrooms through a food processor until they are in tiny chunks, and add them to the olive oil. Cook and stir for a couple of minutes. Add salt and pepper to taste. Meanwhile, chop the cremini or portabello mushrooms with a knife into medium-small chunks. Think bite-sized pieces. Add those to the pot and let them cook for a few minutes. Add half of the marinara sauce you made earlier. It’s about 4 cups, but no need to precisely measure. Just make sure the proportion of sauce to mushrooms looks right to you. Simmer uncovered over medium heat for about 20 minutes, just until the mushrooms are cooked and all the flavors have had time to cook together. Serve over your favorite pasta. I like to mix the pasta with a little bit of sauce first and then serve it with another dollop of sauce on top. Finish it off with a shaving of fresh parmesan cheese.